After breakfast, you’re driven to Queen Elizabeth national park, have a stop over to look at the Royal Drum makers, stand on the Equator and be in both hemispheres at once. Lunch in mbarara and thereafter continue through savannah grasslands seeing banana plantations and herds of Ankole cattle with their incredible long curving horns. Access Queen Elizabeth through katunguru gate, the park is host to a large variety and volume of wildlife. It boasts one o the highest bio diversity ratings of any game park in the world, from the open Savannah to Rain forest, dense swamps and beautiful crater lakes to the vastness of Lake Edward. Almost 100 species that include Hippos, Lions, Buffaloes, Leopard, Spotted Hyena and the elusive giant forest hog. The primates include Chimps, Black and white Columbus Monkeys, Blue, Black Faced Red Columbus, and Red Tailed monkeys and Olive Baboons. Late afternoon go for evening game drive to Kasenyi Area of the Park with chance of seeing numerous elephants as well as water hogs, lions, hyenas, warthogs, Uganda kobs, waterbuck and bushbuck as well as the salt lakes. Have diner and overnight stay at mweya lodge / jacana lodge. Very early go for a morning game drive. 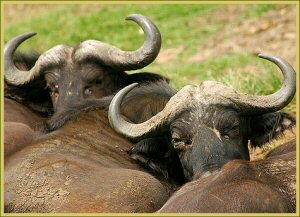 Expect to see various animals like antelopes, hyenas, Lion, elephant and many others in the middle of savannah grassland. tracker. The day is not easy at times but appealing. Return to your lodge for dinner and over night. Early morning, after breakfast drive back to Kampala, lunch en route arriving early evening. • Full time English speaking Driver/guide. The package excludes expenses of personal nature like: Visa, drinks, laundry, tips to local guides, telephone, personal insurance, tobacco etc. Tel +256774161700, +256701161700, +256712429306, +256414668877 Fax +265414348666 P.O.BOX 2633 Kampala, Uganda.